Pope Francis will make his first official visit to Rome's Great Synagogue next year since elected in 2013, the Vatican and the city's Jewish community confirmed on Tuesday. The Pope's vsit to the synagogue on the bank of the Tiber River will take place on Jan. 17. He will be the third Roman Catholic pontiff to visit the seat of Rome's Jews after his predecessor Benedict and John Paul II. Pope Francis welcomed over a hundred leaders of the World Jewish Congress (WJC) last month and issued a strong condemnation of anti-Semitism. At a private audience with WJC President Ronald S. Lauder, the pontiff made it clear that outright attacks against Israel’s existence is a form of anti-Semitism. “To attack Jews is anti-Semitism, but an outright attack on the State of Israel is also anti-Semitism. There may be political disagreements between governments and on political issues, but the State of Israel has every right to exist in safety and prosperity,” Pope Francis told Lauder and his delegation. The Pope’s meeting with Lauder came on the anniversary of the 1965 declaration Nostra Aetate, which condemned anti-Semitism and completely transformed and improved relations between Jews and Catholics. 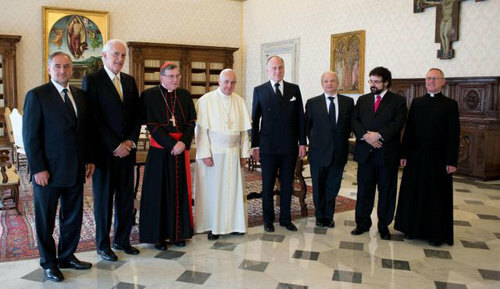 Photo (left to right): WJC Governing Board Chairman David de Rothschild, WJC President Ronald S. Lauder, Pope Francis, WJC Treasurer Chella Safra, President of Latin American Jewish Congress Jack Terpins, WJC CEO Robert Singer and Executive Director of the Latin American Jewish Congress Claudio Epelman.